My name is Alan Hoskins and I live near the southeastern Illinois town of Eldorado. The attached pictures are of my 1967 John Deere 4020 powershift. This particular unit is very special as it is the first John Deere tractor driven by me. A neighbor who owns the farm adjoining ours purchased it new in 1968 and I purchased it at their farm closeout auction in March, 2002. The restoration of this unit began in November,2002 and was completed in January, 2004. 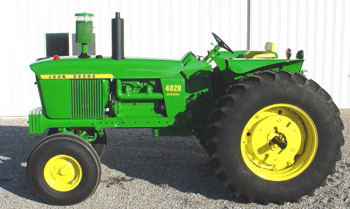 Presently, the tractor has approximately 8,800 hours. The tractor is now officially “retired” from heavy farm labor and will be utilized for parades and other “show” type events.